The Shoulder Stand or Sarvangasana is an inversion posture in advanced yoga that positions the whole of the upper body with the legs turned upwards, the entire weight of it resting mainly upon the shoulders, and secondarily on the neck and head. The Sarvangasana is practiced in modifications, of which the Salamba Sarvangasana or supported shoulder stand has the most advantages and ensures an ease of practice. The asana is recommended at the end of a yoga session to have a calming rush of blood sweep through the body and into the head. 1. Begin the Sarvangasana Yoga Pose supine with your back to the mat and keeping your arms relaxed by your sides. Now, fold up your knees and tap the floor with the soles of your feet. Inhale deeply. 2. Start compressing your abdominal muscles with a hearty exhalation and dig down with your upper arms into the floor. With the supportive force created from the upper arms, lift your feet and waist up from the mat. At this juncture, your front highs will be compressing towards your chest. It is not an easy feat to lift the feet and lower back just like that and is doable only at an advanced level without support. Therefore, you need to bend your elbows and create a bolstering base with your hands for your waist to rely upon. 3. Curve your hands and place them under your hips at this point of the Salamba Sirasana and draw in your shoulders and elbows to each other. Broaden your palms across your back and keep lifting the hips till they align directly over the shoulders. At this point, your spine is positioned perpendicular to the floor. 4. Retain the elbows about shoulder-distance wide. This will make up for the unavoidable beveling of the sides. In this posture, the onus of the body weight should be entirely on the shoulder blades and upper arms, though, must be well-distributed. The head and neck should not be bearing a lot of mass, lest the chances of injury rise. 5. Next, in synchrony with an inhalation, extend out the bent knees and also make your legs straight. At this point, you must lift through the big toe balls. Bring your legs together and hoist up through the toes as you feel your tailbone extending towards the ceiling and also pull out through the inner sides of your legs. 6. Fix your gaze towards your chest and keep the throat and jaw relaxed and loose. The only parts of your body that must compress at this point are your shoulder blades pressed against your back. Also, shift your sternum towards your chin. 7. Release from the posture by bending out your knees, signaled by an exhalation and downing the waist slowly to the ground as you trot your arms slowly from beneath. The discharge can be facilitated after holding out the posture anywhere along 10-15 breaths, then you can roll on your back, de-flexing vertebra by vertebra. Note: Prop usage is highly recommended in this posture performance, especially for the ease of neck movement. Also, to lessen injurious neck strain, don’t keep shifting your gaze which may unconsciously lead to sideways head movement. Relieves Anxiety By Calming the Brain- Like all yoga inversions, Sarvangasana ensures a good blood flow to the head and capillaries. This invigorates portions of the brain with fresh oxygenation. Constricted portions of the brain responsible for psychological reactions, which happen as a response to stressful living get to unwind and then bring clarity in thought. Direct Thrust in the Neck and Regional Glandular Stimulation- One of the largest endocrine glands ‘Thyroid’ is situated in the neck, right below the larynx. Responsible for the secretion of T3 and Thyroxine hormones, this gland is a major site of mood mechanism in the body. The direct thrust received through Sarvangasana in this area helps the mechanism run well. Regulates Metabolism with Improved Digestion–Improved digestion and regulated metabolic rate are the major benefits of Sarvangasana Asana that come with a challenging inversion which also creates a useful pressure in the abdomen. Blanket Support for Back Protection- Blankets come to the rescue when figuring out how to do Sarvangasana easily and you would like more space for your chest to open up and the neck to be loose. Additionally, this is a full plan for extra back cushioning. Align your neck and head on a stack of blankets. The folded-up structure should feel firm. Also, remember to arrange your neck and head a little above the edge of the folded blanket structure, because once you start in the posture, your shoulders will naturally roll by the edge. Blocks for the Sacrum to Make It Slight Easy- Traditionally, the sarvangasana is practiced with self-support under the sacrum with hands. This can be alternated or given half-way support with the blocks. With 1-2 blocks placed beneath your sacrum, you can assume a halfway pose between Viparita Karani and the complete Salamba Sarvangasana,while your arms can relax by your side and the neck comfortably stretched. Wall-Supported Shoulderstand- This is Sarvangasana for beginners during which a wall can be used as a support base after you have successfully hoisted up your lower body, hips, and legs. This will mitigate the excess of weight from your shoulders. Being an advanced and involved posture, the Sarvangasana Yoga steps have several contraindications. Avoid it in a sequence in cases of high blood pressure, during the menstrual period, and on having experienced spinal infirmity. Since the thoracic region is directly under pressure in this posture, a state of glaucoma, acute thyroid troubles, and neck injury cannot sustain the posture. There is also an onrush of blood to the eyes anticipated in this posture, so check with your ophthalmologist before moving into a full-fledged Sarvangasana practice. In addition, heart problems, ear-related special conditions, advanced age, spondylosis, and slip discs are no states to practice this posture without great risk factors. 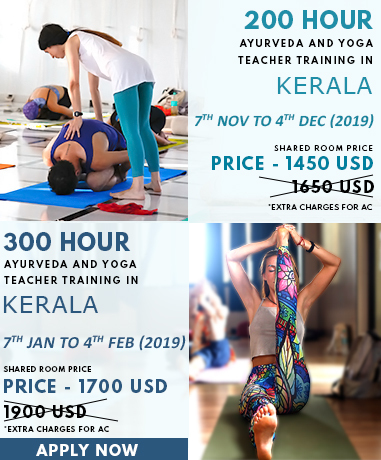 To know about Sarvangasana in further detail, explore our Yoga Teacher Training In India.